Possible "Liquid Lake" Detected Beneath Mars' Surface - Joe.My.God. 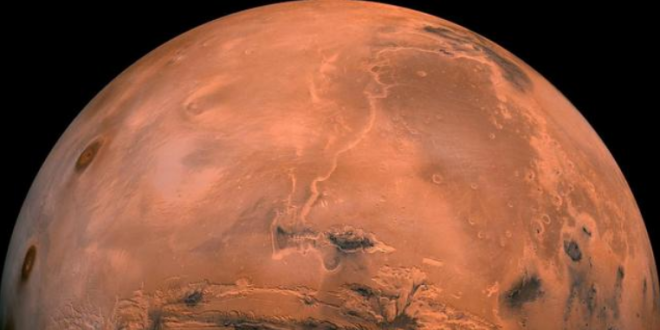 The Italian Space Agency announced Wednesday that researchers have detected signs of a large, stable body of liquid water locked away beneath a mile of ice near Mars’ south pole. The observations were recorded by the Mars Advanced Radar for Subsurface and Ionosphere Sounding instrument—Marsis for short. “Marsis was born to make this kind of discovery, and now it has,” says Roberto Orosei, a radioastronomer at the National Institute for Astrophysics, who led the investigation. His team’s findings, which appear in this week’s issue of Science, raise tantalizing questions about the planet’s geology—and its potential for harboring life. Marsis collected its evidence from orbit, flying aboard the European Space Agency’s Mars Express spacecraft. It works by transmitting pulses of low-frequency electromagnetic waves toward the red planet.